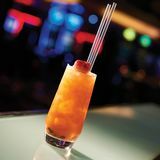 The Icon Bar is a deliciously attractive bar, located within the stunning Empire Casino. This French-boudoir style cocktail bar is the ideal post-work or evening chill out venue. With a terrace overlooking bustling Leicester Square, this stunning venue is a must-see. By sending this booking your details will only be sent to The Icon Bar and will never be shared with other third parties. By clicking this box you agree to the Terms and Conditions set out above. 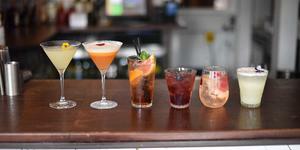 You can book to reserve an area of The Icon Bar for you and your friends. Just enter your requirements below to see what they have to offer. What did you think of The Icon Bar? The Casino at the Empire’s bar The Icon Room is big on glamour and you don't have to be a VIP or a Hollywood A-lister to get in. Located on the first floor of the uber-glam Casino at the Empire, everything in The Icon Room is plush, plush, plush. 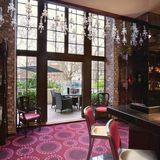 From the red velvet sofas and gilded mirrors to the antique patterned wallpaper and glittery chandeliers, each and every inch of bar is supremely glitzy. The room is small, with only a few seats, and there’s an outdoor balcony complete with Greek-style frescoes and colour-changing lighting where you can sip your cocktails and admire (or wrinkle your nose at) the view of Leicester Square. 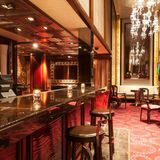 Whilst all this glitz might be a bit much for the average London bar-goer, access to The Icon Room is dependent upon getting membership to the casino, which is easy - and free. You just need to show a passport and enter your details. However, if you do happen to be A-list then there's a passageway from the bar to the cinema next door, so famous faces can sneak in and out or wave to their adoring public from the balcony. Champagne cocktails are the order of the day here, with several drinks perfect for celebrating. 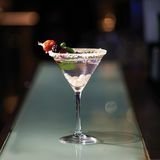 Try the aptly named Royal Flush, which combines gin, cherry liqueur and Champange with muddled maraschino cherries. But if that's not to your fancy, there are loads of other cocktails to try, with cool vintage celebrity names like the Dean Martini (made with vodka, apple juice and Champagne) and the Betty Page (Patron Anejo, Cointreau, mandarin and ginger). The bar staff are some of the best in the capital, but would you expect any less from a place that imports their showgirls from Caesar’s Palace in Las Vegas? Expect to see mentions of The Icon Room splashed across celebrity gossip pages in all the tabloids. The Icon Bar in the Casino at the Empire looks like you would feel uncomfortable in the posh location and furnishings but it’s actually the opposite. It really is a warm lively place that makes you feel as though you belong whilst ordering a selection of random drinks you’ve never heard of and a few you have! 39 destinations curated by Andrew M.